A California breach of contract notice lets a person or business know that they are not holding up to contract requirements. It is best practice to explain in detail how a party to a contract is not fulfilling her promised commitment. The contract itself may require either party to provide notice of breach before pursuing legal remedies. A California breach of contract notice allows you to identify the breach and detail steps that must be taken to cure the problems or end the contract and obtain compensation for damages. The breach of notice can be broad or specific. A broad notice allows parties to talk openly about performance. At San Diego Esquire, our attorney can draft a breach of contract notice letter on your behalf. Sign up to get started. Contracts often contain a notice provision clause which specifies how notice of a breach of contract should be handled. For example, a notice of a breach of contract may have to be sent via email, certified mail, or fax to a party. Check the notice clause of your agreement to ensure you are complying with the requirements of providing notice. The notice should specify the part of the contract that is in breach. A breach – a party’s failure to perform under an agreement – usually occurs as follows: 1) The other party failed to perform a provision of the contract in a timely manner (ex- payment has been delayed to the Contractor); 2) The other party has provided written notice that it will no longer perform its obligations under the contract in the future; or 3) The other party has made it impossible for you to perform your contract obligations. Clearly identify which clauses in the contract the breach is impacting. Notices should only be provided in the event of a material contract breach. The breach of contract notice is provided to solve contract performance issues. Specify how the party can cure performance and provide a reasonable deadline in doing so. Depending on the nature of the breach, it may be appropriate to amend the contract and re-scope the statement of work or the areas in which the breach occurred. A party may have a reasonable justification for any delays or other issues related to performance. A contract amendment may help resolve the issue altogether. Once the notice is sent, the party in breach may cure or push back on the issues raised. You may want to consider hiring a mediator to resolve any ongoing issues. Seek legal counsel as a final option. Contact San Diego Esquire for more information about our California breach of contract notice service. We can help you draft a notice to send to a party in material breach of contract. 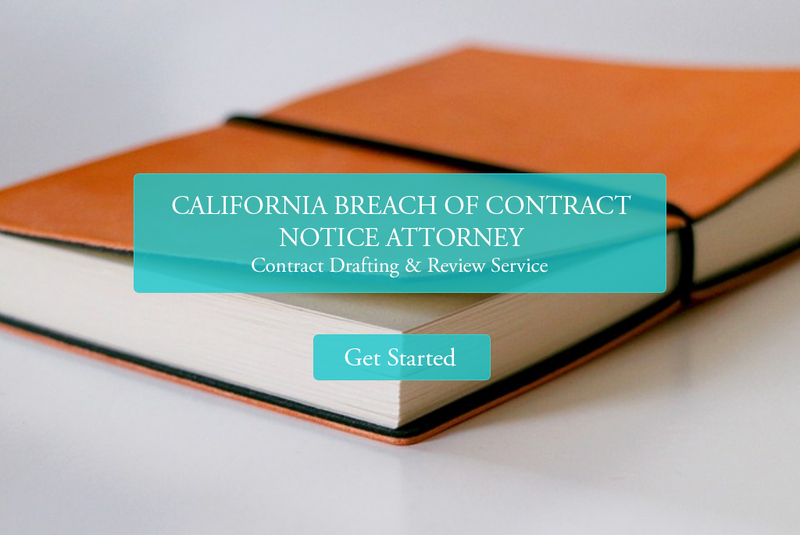 California breach of contract notice drafting services starting at $95.